What would you do with 4 million dollars? 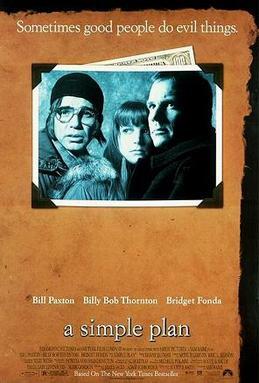 When two brothers (Bill Paxton and Billy Bob Thornton) find a body and a bundle of cash in a downed plane, they plot to hide the loot and split it later. It’s a simple plan, until things go murderously awry. Like the Coen brothers’ FARGO, Sam Raimi’s A SIMPLE PLAN is an ice-cold neo-noir as chilling and bleak as its snow-covered Minnesota locale.This a fine suspense thriller that digs deeper and deeper into the values and dreams of these small town characters. A Simple Plan is suspenseful, powerful, and as merciless as Fargo. Its very great to see how all these characters seem so real and you can tell their motives at every moment so every moment that happens seems to have a reason. The most significant thing about this film is that you can see what leads them to the next step. Each of their ideas are shown at the right amount of pacing so they don’t go to quickly in showing these characters reactions but also don’t take too long in showing. The mood is something else of extraordinary, as you can feel just through the music and the expressions of the characters that this is how you should feel if this was happening to you right then and there. Director Sam Raimi does a wonderful job at creating the right pace, mood, and overall right script. Much of the movie’s script is very similar to the novel’s script as well. Though some motives and character traits are changed Raimi still sticks close too the novel without getting too obvious. A great directing job from a guy who would later go on to direct the Spider Man movies. The heart of this movie lies within the strong performances from its trio of leads. Bill Paxton is great as a man who just wants what’s best for his family and Bridget Fonda is his wife who just wants get out of her ordinary miserable life. Much of the acting credit goes to Billy Bob Thornton who’s understated and profoundly moving performance is what gave this movie its heart. Each stars have a chance to show their acting skills and each do very well and fully make this film as effective as it was. The only problem I had with this film is not that bad at all really. The film being much like Fargo did not have as much comedy in it, if any at all. To be realistic in any depressing situation there will always be comedy to lighten things up and since this was such a realistic movie I wondered where the comedic tone to it was. In my opinion the film was way too dark without any light tone whatsoever. The film kept me on the edge of my seat and with every twist and turn in the story, I felt myself hooked even more. A Simple Plan is a very simple movie to get used to just don’t watch this after King of Queens myself.